Home :: Outdoor Radios :: Mikrotik Outdoor Radios :: Mikrotik RBQRTG-5SHPnD (export version) is a high gain, high speed 5GHz oudoor wireless device. Dual polarization 802.11n and Nv2 TDMA technology help to achieve even 200Mbit real throughput speed - New! 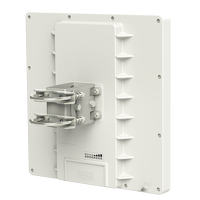 Mikrotik RBQRTG-5SHPnD (export version) is a high gain, high speed 5GHz oudoor wireless device. Dual polarization 802.11n and Nv2 TDMA technology help to achieve even 200Mbit real throughput speed - New! Mikrotik RouterBoard QRT-5 (RBQRTG-5SHPnD) is rugged outdoor flat panel antenna, with a built in RouterBOARD. The device has a 23dBi antenna and a super high power 5Ghz wireless transmitter. Gigabit Ethernet allows full radio throughput to your network. Complete with a ready to mount enclosure and built-in 23dBi 10.5 degree dual polarity antenna, the package contains everything you need to set it up in a matter of minutes. The inside of the case is covered in special shielding to improve operation in high interference areas and antenna front to back ratio. Not for use in US and Canada. Use RB911G-5HPnD-QRT-US for those countries. Mikrotik RBDiscG-5acD-US (for US and Canada) DISC Lite5 ac is a super high speed 5GHz wireless device. Dual polarization 802.11ac and Nv2 TDMA technology help to achieve 540Mbit real throughput speed. New! Wireless Wire Dish (RBLHGG-60adkit), pair of preconfigured LHGG-60ad for 60Ghz link - New! Mikrotik LtAP mini LTE kit-US Small weatherproof wireless access point with LTE modem for the Americas - with 2 SIM slots and GPS - New! Mikrotik RouterBoard wAP LTE kit - (just add LTE card of your choice) - New! Mikrotik mANTBox 12s RB911G-2HPnD-12S 2.4GHz 12 dBi 120 degree Dual Polarity Sector antenna with integrated Radio - New!